153 concerts in 29 countries, 700,000 attendants, and more than 150,000 miles traveled: Dub Inc’s Paradise Tour was so successful that, if music was a competition, they’d put almost any other reggae artist to shame. The crew from St. Étienne, France travels the globe tirelessly to celebrate their unique sound with their dedicated and faithful fan base. Virtually everybody who sees Dub Inc’s energetic and super tight live show is hooked immediately, once and for all. Although the band focuses much more on its studio recordings now than it did back in its early days, it still sees itself as a live band before anything else. Besides its five studio albums, Dub Inc has two live albums on the shelfs: Live, recorded in 2006, and Live Hors Controle, recorded at Zénith in their home town St. Étienne in 2011. The latter was a gift to Dub Inc’s loyal fans, featuring the unique ambiance of a sold-out show at home. Missing so far from the band’s discography was a live DVD. The Rude Boy Story documentary (2013) came with ample live imagery, but that footage didn’t show a single concert, it had been recorded on numerous festivals instead. Live Paradise Tour At L’Olympia changes that. 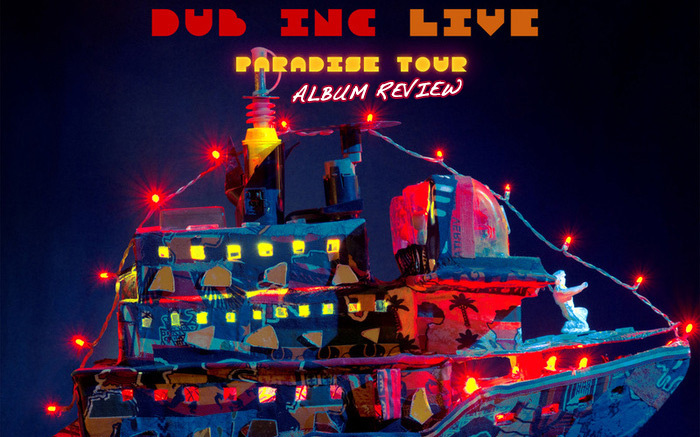 Dub Inc’s third live album comes with two audio CDs and one DVD, featuring a whopping nineteen songs plus a two-minute intro. The HD material was recorded during a single concert at the legendary L’Olympia in Paris, France. The set list contains most tracks from Dub Inc’s last studio album, Paradise, but les Stéphanois included the biggest hits from the preceding Hors Controle as well and threw in a few of their classics on top. “I don’t want to be an emperor. That’s not my business. I don’t want to rule or conquer anyone. I should like to help everyone, if possible, Jew, gentile, black man, white. We all want to help one another. Human beings are like that. We want to live by each other’s happiness–not by each other’s misery. We don’t want to hate and despise one another. More than machinery, we need humanity. More than cleverness, we need kindness and gentleness. Without those qualities, life will be violent and all will be lost. The hate of men will pass, and dictators die, and the power they took from the people will return to the people and so long as men die, liberty will never perish. Charlie Chaplin easily understood back in 1940 what the ruling classes of the world refuse to understand in their endless greed in 2015, what they couldn’t ever understand for the simple reason that being determines consciousness. Dub Inc’s mostly working class background determines their understanding of these simple truths, and putting this progressive Chaplin quote before the fun speaks volumes to their political consciousness as well as to that of their fans. It serves to explain the Dub Inc phenomenon at least as much as does the music that is to follow. The crowd’s reaction to the first bars of Tous Ce Qu’Ils Veulent, the second track, is amazing: Absolutely everybody in the audience sings the lyrics before Komlan and Bouchkour really get started. The song strongly denounces the narrow-mindedness of those semi-fascist politicians in France and elsewhere that deny people of culturally diverse backgrounds (an indirect result of centuries of colonialism, of course) their own identities. The audience’s fierce reaction suggests that Dub Inc is to be seen as a movement rather than just a band, inasmuch as they voice the opinions of and unite those political subjects that go unheard in France’s so-called “democracy” today like few other artists–Diam’s maybe, or Sniper. Cuts in quick succession, almost as many close-ups as long shots, focus equally on the musicians on stage and the massive that isn’t reduced to be merely standing by and consuming. The audience is an integral, active part of the Dub Inc live experience. The ethnic composition of Dub Inc’s fans is surprising, though–it doesn’t reflect the ethnic diversity of today’s France or of Dub Inc itself at all, it’s almost exclusively “white” instead. Whether that has direct economic reasons (ticket prices), is a result of personal/class taste (Bourdieu comes to mind here) or just another indicator for the sharp trifold division of the French reggae scene, one could argue that on a more abstract level, it actually shows how deeply engraved colonialist structures still are in the Fifth Republic–even the resistance against it of people who have quite a few goals in common is deeply divided. In any case, Dub Inc’s fault it is not. Tight as ever, the band’s performance on Live At L’Olympia is almost faultless. You have to pay very, very close attention to discover the few minor errors that only serve to remind us that the band does indeed play live. The audio mixing is ingenious. The bass sounds saturated and deep, trebles are crystal clear, the vocals are just perfect, and the ever singing along audience is always well audible, but never overrides the music. As crisp as the audio is the elaborate lighting that lets the hard-working musicians on stage sparkle. Close-ups bring the viewer closer to them then one could ever get during a concert. Throw in feature guest Skarra Mucci on They Want and guest musicians Alaoua Idir and Antony Gatta on Foudagh for the coolest concert experience possible Dub Inc could have chosen for their first live DVD. Live Paradise Tour At L’Olympia is a must for every Dub Inc fan, and the only thing more convincing for those who aren’t yet is, well, attending an actual live show of the Stéphanois.